Raffle: Elizabeth Alves brought a $50 gift certificate to Holdren’s. 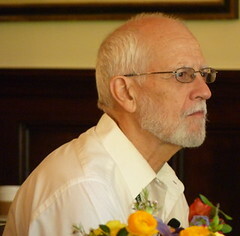 Tom Heath announced this weekend’s Whittier work day. Kimberly Coley reminded members to bring canned goods to the November 20 meeting for the Unity Shoppe food drive. Also, there is extra money in the community service budget for this year, so members are invited to suggest project ideas. Connard Hogan announced that the dictionary labeling party will be Nov. 18 at his home at 5:30 PM. Stanley Weinstein, of the Rotary Club of Santa Barbara Downtown, announced that his club sells poinsettias as a fundraiser at this time of year. President Betsy Munroe will email the order form to all members. Don Bennett continued recruiting volunteers for Salvation Army bell ringing. It’s starting the Saturday after Thanksgiving. Please sign up. He needs more help on the first Saturday, November 30th. 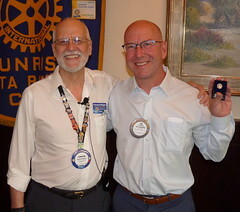 Scott Burns wants more people to meet Gloria, and she can sometimes use a ride from Goleta to our Rotary meetings and back to San Marcos High. A few people volunteered to help. Bill Ringer collected donations for relief efforts in the Philippines. The club will collect next week as well. Gary Jensen encouraged members to look at Sandy Grasso-Boyd‘s photo album from the Fiddlers’ Festival. Getting to know you with Tom Heath. Nevermind. Connard Hogan. Connard was inspired to join Rotary on an NID, and he credits E. Russell Smith and Karen Kawaguchi. The Rotary Minute with Sandra O’Meara was about the Rotary annual conventions: 1910 was the first convention with 50 attendees. In 2004, more than 43,000 people attended. Ed Fleming won the raffle, which raised $90. Pay and tell with Sgt at Arms Scott Burns. 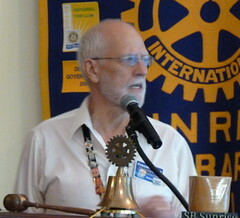 Program:Jim Ruh led a club assembly about fundraising for our club’s foundation. He has led the ad-hoc fundraising committee. The fundraising committee is composed of: Jim Ruh, Dana Goba, Eric Ryan, Joanne Schoenfeld Orenstein, Susan Klein-Rothschild, Andy Doerr, Joe Clark and Betsy Munroe. Jim first described the research process, including club surveys, Rotary research, committee meetings, and a meeting with the board. Next week we will vote on the recommendations. The PowerPoint will be emailed to members. Combined, our two fundraisers raise up to $25,000 per year — and often less. Two big concerns in addition to wanting to make more money: lack of club member participation and that events don’t clearly message who we are or what we do with the money. Regarding the 2014 golf tournament: If we don’t have 2-3 additional co-chairs by the end of the month, we will cancel the golf tournament. Watch your email for more news about this, including the presentation slides and a ballot soliciting your thoughts.